The Daunt Sub Aqua Club is now open to new members for the 2015 diving season. If you are interested in joining and have an existing qualification from PADI, CMAS, BSAC, or from any other diving organisation, please send us a mesage or phone John on 087-4184808. Look forward to hearing from you! 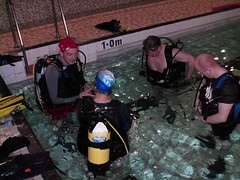 We rergularly train new diving members from scratch! There’s no previous diving experience required, all the training from lectures to pool sessions will be provided over the year and we’ll have you diving on your first club trip. Once you’ve the training done, it’s just a matter of turning up for dive trips. You’ll get an internationally recognised diving qualification at the end of the year (CFT/CMAS). If you’ve already got a diving qualification with a non-CFT organisation, we’ll be able to cross you over to the equivalent CFT level. Come to the intro talk and our diving officer will go through this process with all the cross-overs. For more info, just send us a mesage.